One of my all-time favs. They grow nicely out here in the desert and they produce incredibly attractive flowers. I've noticed that a few people have them in their front yards, but it would be nice to see more of them! They're easy to grow and care for. I recommend them highly! This page says that they will "tolerate afternoon part shade" but the question is if they can handle scorching temperatures! I've seen some growing around the area and they seem to do okay. Easily grown in average, dry to medium moisture, well-drained soils in full sun. Tolerates some afternoon part shade and drought. Also tolerates poor soils. Soils should have good drainage. Easily grown from seed sown outdoors in fall or early spring. Plants will spread, sometimes aggressively, by rhizomes and self-seeding to form large colonies. I visited a friend's house last week and the primrose plants in her backyard are literally producing hundreds of flowers right now. It was so pretty and the good thing is that the primrose plants will continue to produce flowers for several weeks unlike some plants that just produce a few flowers and that's all until next year! I visited a friend in California City a few days ago and she had a bunch of these plants in her yard. She said that they were producing flowers like crazy a few weeks earlier, but even now they're still putting out a few. She said that they're tough plants and that they can take the heat. This is a different species of Oenothera than the one this thread is about. It's hard to say to what degree Oenothera speciosa shares properties with Oenothera biennis. The color of their flowers is different and their growth habit is also different, but regarding their biochemical properties I have no information. I stopped by a friend's house over the weekend and her Mexican evening primrose plants are spreading like wildfire. They looked pretty weak during the summer months, but apparently they like the weather we've been experiencing these last few weeks. Hopefully we get lots of rain over the next few months so we can look forward to an awesome spring bloom! Once the plants get extablished they do real well even out here in the desert providing that they get enough water and they are protected from the sun for a few hours a day. 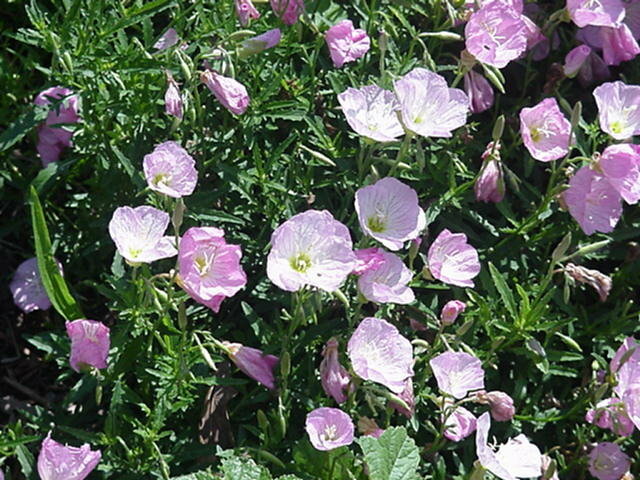 They can be like a weed in places where the weather is more moderate. They spread through underground runners and they can get out of control real fast and it can be hard to keep them from crowding out other plants. Does anyone know a trick to get Mexican Evening Prirose plants to bloom in the fall? Most of the plants in the yard belonging to a friend are pretty beat up from the summer heat, but could they be revived and coaxed into blooming around the end of October? Would some fertilizer and a little extra watering get them to produce some flowers? I saw a few flowers on a friend's Mexican evening primrose plants yesterday. Last year she had hundreds of flowers for over a month and things are just getting started this year. These plants are tenacious and they produce some great flowers. Things are off to a good start this spring!